We're so excited to feature landscape paintings by local artist Kathy O'Leary. number of paintings will be available as free posters starting July 13th. Twenty six years after making a mid-life career change from the natural food business to art, I continue to work everyday at honing my skills and expanding my vision as a painter. 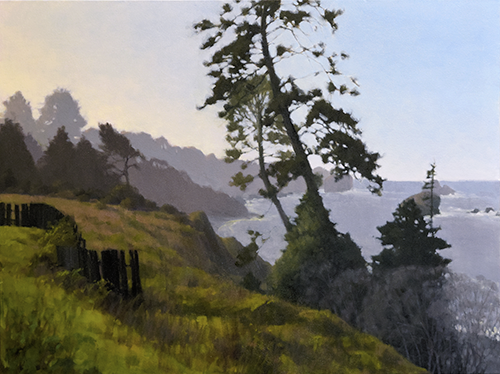 As a California native, I believe our state has some of the most beautiful and varied landscapes of anywhere I have traveled, yet it was the incredible variety and beauty of Humboldt County that inspired me to become primarily a landscape painter in the first place. After experimenting with several mediums, I discovered that oils gave me the most vibrant color, and the most flexibility, for working on both small and large sized canvases, indoors and on location. While I continue to paint close to home, I also take several trips each year to photograph and paint on location (plein air) throughout the state. Most of my smaller paintings are done outside on location. I use field sketches, and my photographs for development of larger pieces in my studio in Old Town, Eureka. Over the years I have had representation in several galleries through out the state, however, my longterm representation continues to be galleries in Sacramento and Burlingame. Much of my work can be viewed on the internet at: kathyoleary.com, and on Facebook at Kathy O’Leary Fine Art. In addition my work can be seen locally at my studio by appointment, and in Trinidad, at the Trinidad Art Gallery (an artist’s co-op), and Strawberry Rock Gallery, as well as in juried exhibitions locally and outside of our region. My work can be seen locally at my studio by appointment, and in Trinidad, at the Trinidad Art Gallery (an artist’s co-op), and Strawberry Rock Gallery, as well as in juried exhibitions locally and outside of our region.